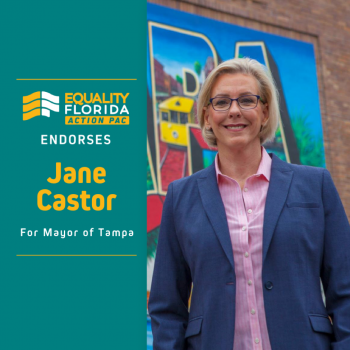 Tampa, FL – Today, Equality Florida Action PAC, Florida’s largest political committee working to elect pro-equality candidates, joined with LGBTQ Victory Fund to announce the endorsement of Jane Castor’s historic race for Mayor of Tampa. Term limits restrict current Mayor Bob Buckhorn from seeking a third term making this an open and highly competitive race for Florida’s third largest city. For six years Castor has served as Chief of Police for the City of Tampa and has emerged as both a frontrunner and rising star in the crowded field of eight candidates. If elected, Jane Castor would be the first openly LGBTQ person to lead one of Florida’s five largest cities and only the fourth openly LGBTQ woman to hold the post of Mayor in Florida. Castor’s win would make her one of the few LGBTQ women elected to lead a major U.S city and has already garnered statewide and national enthusiasm from supporters of LGBTQ rights. In 2018, Equality Florida Action PAC and Victory Fund partnered to prioritize and run a major program in the historic campaign of State Representative Jennifer Webb, the first LGBTQ woman to serve in the Florida legislature. Today, both organizations pledged to bring the same national and state-level focus to Castor’s boundary-breaking candidacy. “I am so proud to accept the endorsement of Equality Florida & The Victory Fund—two incredible organizations devoted to advancing equality across the state and country. As Tampa's next Mayor, I am committed to fighting to make our city, which I love so much, an even more welcoming and accepting place," said Jane Castor, candidate for Mayor of Tampa. Equality Florida Action PAC is Florida’s largest political committee working to elect pro-equality candidates. Paid political advertisement in-kind by Equality Florida Action PAC P.O. Box 13184 St. Petersburg, FL 33733. Approved by Jane Castor for Mayor of Tampa.